I hope this email finds you well and ready to celebrate another great 4th of July! I'll be marching in the Lake Bluff parade again this year and hope to see you there. There are many celebrations taking place throughout Lake County- festivals, parades, concerts, and fireworks. Click here to view a list of activities for the weekend, and best wishes for a safe and happy 4th. You are invited to an Open House to discuss the potential improvement of the interchange of US 41 and IL 176 on Thursday, June 25th, 4:00-7:00 PM, at the Lake Bluff Elementary School (350 West Washington Avenue, Lake Bluff). The general scope of work for this improvement is anticipated to consist of interchange reconstruction, widening IL 176 from IL 43 to Skokie Valley Road to provide two through-lanes in each directions separated by a median; traffic signal replacement; pedestrian and bicycle accommodations; and stormwater drainage improvements. The purpose of the hearing is to present the preferred improvement, impacts to the Lake Bluff Golf Club, solicit viewpoints on potential noise abatement measures, and obtain public input. The public is invited to discuss North Chicago's comprehensive plan Thursday evening, June 25th, 6:30-8:00 p.m. at the Foss Park Community Center, 1730 Lewis Ave. in North Chicago. Give your input on the plan, which will provide a roadmap for reaching the community's long-term physical, socioeconomic, and cultural goals. Read more about the plan, timeline and documents at the Chicago Metropolitan Agency for Planning website. Visit the new Potbelly on 176 near the new Target on Friday, 11:30am - 1:00pm and 5:00-7:00pm to receive a sandwich, chips, and a drink for $5.00. All proceeds go to the Friends of the Lake Bluff Library. Attend a free health fair in observance of National HIV Testing Day 10:00am - 2:00pm Saturday, June 27 on the front lawn of the Belvidere Medical Building, 2400 Belvidere Road, Waukegan. In addition to free resources, free tests will be available for Hepatitis C and HIV. For information, call 847-377-8450, or visit the website. Through August 31, each full-paying adult golfer may bring up to two children (ages 17 and younger) for no additional charge to Brae Loch, Countryside or ThunderHawk golf courses. This promotion is valid Monday–Friday, anytime; Saturdays and Sundays, after 4 pm. Call 847-968-4295 for details. The Household chemical Waste Collection Event is scheduled on July 18th, 8:00 AM to 2:30 PM at Deerfield High School, 1959 North Waukegan Rd, Deerfield. Not Accepted: Latex paint, DEA Controlled substances, business wastes, farm chemicals, propane tanks, lead-acid and alkaline batteries, explosives, medical or biohazard wastes, fire extinguishers, smoke detectors and household electronics. HCW collections sponsored by SWALCO (Solid Waste Agency of Lake County) are for Illinois Residents ONLY. If you would like to learn more about SWALCO programs and services, visit www.swalco.org or call 847-336-9340. Lake County has put into place laws that will hold anyone accountable for hosting an event or gathering during which underage drinking or illicit drug use occurs. Lake County State’s Attorney Mike Nerheim sits down with Special Investigator Terry Vandergrift to further explain these ordinances. Watch now. Construction has started on the final section of the Des Plaines River Trail that extends just south of Riverside Drive and north of Estonian Lane in Lincolnshire. Completion is expected later this fall. The 8-foot-wide paved trail will run about 1,600 feet long and close the gap between the existing northern and southern sections of the trail. During construction, southbound trail users can still access the Lincolnshire trail to Milwaukee Avenue. South of the project, the trail will be closed at Estonian Lane. The trail access point at the rear parking lot of the former Cubby Bear property also will be closed until the project is complete. Check the website for updates. Career opportunities cover a wide spectrum of fields. Check out our career portal for the current job listings for Lake County government. Shop Local at Farmers Markets! Shop for fresh fruits, vegetables, baked treats and goods while supporting local businesses at one of Lake County’s farmers markets. Check out Lake County’s Farmers Market Finder to discover a farmer’s market near you. Last month I wrote about mental health and its impact on our law enforcement, jails, and courts. As you may already know, this is a national effort and we are fortunate that Lake County has been working on this issue for several months. The jail diversion programs already in place (read about a new one below) are effective in reducing our inmate population, and we are researching other strategies specifically targeted towards the mentally ill. Last month I visited Rosecrance Mulberry in Rockford with members of the 19th Judicial Circuit Court, Lake County Health Department, law enforcement, and other agencies to learn about their crisis intervention center. Rosecrance partners with area law enforcement to provide a place where potentially mentally ill persons can be taken to be evaluated and given treatment in a safe area, thereby keeping them out of the justice system and giving them the support and treatment they need. We are also fortunate that Lake County United has made this a central issue for 2015, and continues to be a strong advocate for this critical initiative. Lake County Government joined with many other communities across the country (including Waukegan and North Chicago) in the national initiative to end veteran and chronic homelessness by 2016 and 2017, respectively. Today I attended an Action Camp with stakeholders from across Lake County to identify the greatest barriers and develop strategies that will enable us to achieve this lofty goal. In this instance, “zero” means that we are able to identify homeless veterans, individuals, and families and find housing for them within thirty days. We are very fortunate to have The James A. Lovell Federal Health Care Center, which has sixty beds (always full) for homeless veterans who live in Lake County or surrounding areas. You can read more about the national initiative here and what we are doing in Lake County here. Not only is ending homelessness the right thing to do, it saves money, as shown by numerous studies and real-life examples. To learn more about the societal costs of homelessness, click here to read a snapshot from the National Alliance to End Homelessness. Residents in unincorporated Lake County may be able to save up to 20 percent on their flood insurance policies. Lake County is recertified each year through FEMA based on our floodplain and building code regulations and community information and education. To find out more about floodplain regulations and to determine if you are located in a floodplain, visit our Flood Information page. Last month the Lake County Board approved the appropriation of fees and costs assessed to participants of the Lake County State’s Attorney’s Office Alternative Prosecution Program, giving first-time, non-violent offenders the opportunity to keep a conviction from being permanently entered on their record. Individuals who meet the eligibility requirements must satisfy program requirements which may include: getting a high school diploma, obtaining counseling and/or substance abuse treatment, completing community service hours, paying full restitution to the victim, and finding employment. This program will save money by diverting cases from felony courtrooms and gives a second chance to first-time, non-violent offenders to avoid being labeled as a convicted criminal. Read Press Release​. Be vigilant about eliminating sources for mosquitoes to breed and use protection to avoid contracting West Nile virus. County residents may report areas of stagnant water (conducive for mosquito breeding) as well as locations of dead birds, or learn more about the signs and symptoms of West Nile encephalitis by visiting the Health Department's website. Tuesday evening outdoor concerts at Independence Grove Forest Preserve in Libertyville feature critically acclaimed recording artists performing a range of musical styles. These relax-on-the-lawn concerts are held Tuesday evenings at 7:30 pm through August 4. View concert schedule. The Lake County Health Department Community Health Center tests Lake Michigan beaches and area inland lakes to ensure it is safe for swimmers. Before heading out to the beach, make sure it's open by visiting the Health Center's website, or get information on Great Lakes beaches by downloading the free App myBeachCast. 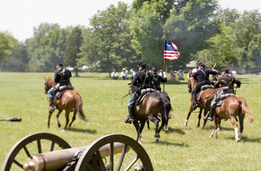 The boom of cannons, the crack of rifles, the galloping of horse hooves welcomes you at the annual Civil War Days encampment, Saturday and Sunday, July 11 and 12 at Lakewood Forest Preserve in Wauconda. Wander the camps to see soldiers, civilians and tradesmen at work. Watch as union and confederate forces collide in battle. Visit the 1863 Summer Fair, meet President Lincoln and shop Civil War era vendors. Kids enjoy period crafts, games and a scavenger hunt. If you haven't been, I highly recommend it! Visit LCFPD.org/civilwar for details. Buy your ticket online, or download a coupon for $1 off admission. Ticket price includes parking and admission to the Lake County Discovery Museum. The Lake County Forest Preserves is auctioning off 41 pier rights for use on the Fox River-Chain O'Lakes Waterway system that were acquired when Lake Marie Forest Preserve in Antioch was purchased. Pier rights will be auctioned off individually with a starting bid price of $1,000. Click here for details. Crime Stoppers is a confidential informant service, partnering with local media, police departments and citizens to help solve crimes. Citizens can contact Crime Stoppers anonymously at 847-662-2222, and those who provide information that leads to an arrest are eligible to receive a cash reward up to $1,000. 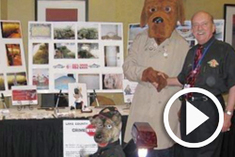 Lake County Crime Stoppers has been serving Lake County for 31 years and has helped solve over 10,000 cases. The Lake County Division of Transportation (LCDOT) will host a meeting to discuss the construction plans and schedule for the reconstruction of Hawley Street in Mundelein. The meeting will be conducted in an informal, open-house format. Exhibits will be on display, and representatives from LCDOT and the project team will be there to provide information and answer questions. 5 to 7 p.m. July 9, Carl Sandburg Middle School, 855 W. Hawley St.
Lake County has been recognized with four Achievement Awards from the National Association of Counties (NACo). The award winners include: “Multi-Media Budget Project,” which includes a new budget web portal, the “2015 Leaders Summit/Lake County Life,” the “Lake County Opioid Initiative,” and the Veteran’s Treatment and Assistance Court (VTAC) Mentoring Program. Click on the links to learn more about these innovative, award-winning programs.